A moderate fall of snow, heaviest el viernes por la mañana. Freeze-thaw conditions (max 1°C el sábado por la tarde, min -4°C el domingo por la noche). Wind will be generally light. A dusting of snow el lunes por la mañana. Freezing level rising with drizzle el miércoles por la noche. Freeze-thaw conditions (max 6°C el miércoles por la tarde, min -4°C el lunes por la mañana). Wind will be generally light. La tabla anterior muestra el pronóstico de tiempo para La Tzoumaz en la altitud específica de 1927 m. Nuestros modelos meteorológicos sofisticados permiten prever pronósticos para la cumbre, la mitad y la base de La Tzoumaz. Para aceder a los pronósticos de tiempo a otras alturas, pinche en la navegación en la parte superior de la tabla. Para una visión general, consulte el Mapa meteorológico de Switzerland. I bought an apartment here a couple of years ago and have spent quite a lot of time in the resort as I live in Switzerland. Overall, amazing skiing. You can get to the Verbier snow faster than the people who are staying in Verbier itself. As the other reviewers say, mainly set up for families in self-catering accommodation. A great little place, nice atmosphere, no need to wear a fur coat like you need to do in Verbier. The guys are chilled out and very open. Mainly Brits, Dutch and Belgians. Skiing on the La Tzoumaz side is great as there a some nice runs to the village (but nothing like the amazing Verbier routes). There are a few bars. On the piste there is the bar Etablons at the roundabout on the way back home, there is a bar/nightclub Vitho that can get busy. Best food to be had at Hotel de la Poste; you will get to know the boss Pascal and the staff well! There is also a bar for food/drinks that the locals use (Les Trappeurs) that is a nice sun-trap in the morning. Best by car as the transport links there are a little patchy at best. Train to Riddes, then you can get a cab or hitch-hike to the village. You can take the cable car to the little village Iserables and then get the bus but connections are terrible and you risk getting stranded. You can get a taxi from Riddes oR you can phone your hotel and they can send someone down to pick you up. Another option is to take the train up towards Verbier and then use the ski lifts to get you there (but this will cost a 1/2 day ski pass). Do not get stranded in Verbier as the last lift up is at about 1600 (ish). If there are a few of you, you should rent a car, depending where you fly into. The village has a free bus that you can use to get around. Otherwise, you can just drive past the ski lift and there is a large, free parking at the very top of the road. There is a fast, modern ski lift to take you up to the top (there is really only one way up) and you can either drop into the Verbier bowl or cruise around the reds and blues and the off-piste runs between them (snow permitting). You can read endless reviews on the yellow-marked trails on other websites (one line of posts, not 2) that you follow down the mountain. Some of the runs are simply stunning and are up there with the best in the world when the snow is good. As normal, the recommendation is not to do this by yourself (think about wearing an avalanche transceiver), but then again if dad can take his 8 year old down here it is not the most extreme. Buy food, in the valley, before getting up the mountain. The little market, in the village, is open 7 days a week, but you pay a premium. If there are enough of you rent a car if you fly to Geneva, it will work out cheaper. Make sure that it has snow tires. If the snow is not perfect, there is a small swimming pool in the village, however, there is an amazing swimming pool at Sion (car drive away). 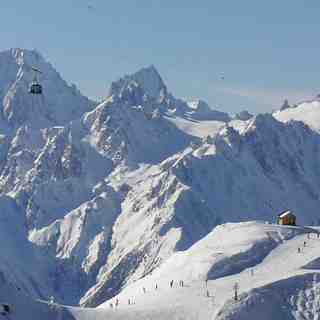 There has been talk of a new chairlift from Verbier to the top of the mountain (the way back, for those not taking the Vallon d'Arby run). This is held up as there are some hold-outs on the Verbier side. I hope it stays that way, then La Tzoumaz stays much quieter. There are also some people talking about a new cable-car connection from Riddes (new the DIY store) to La Tzoumaz. This would be nice for Televerbier, but would cost a fortune; don't hold your breath.